You don’t like mushrooms? !!!! Well sometimes we dont like things similar in nature to ourselves – told you i could work with whatever shocking reason you had for not picking mushrooms first! Amazing you picked it to cook though! Hope your renovation project is going well. Looking foward to seeing the final result! Delicious looking soup, Francesca. And you don’t like mushrooms! Great photography as always by Stefano. Hope you are all well and doing fine. I think that the key to any successful collaboration is to be a team player no matter what and do whatever is necessary to make the entire project a success. This soup was the perfect starter for the winter menu. What?! You don’t like mushrooms?! Like I can talk…I have like list of things I can’t stand so I totally understand! I do love mushroom soup though so this is fantastic! If you can believe it, I’m not a fan of mushrooms either Francesca! I think it stems from the cans of condensed mushroom soup we would eat growing up… ick. Your mushroom soup however, looks rich, decadent, and delicious. You soup looks delish Francesca. I adore mushrooms and will make you soup after market day. The rich and earthy flavour is the perfect counterpoint to what follows. It’s exciting to see everyone’s efforts coming to fruition! Sometimes the “inner clock” is just taking over – no need to follow the calendar each and every time . 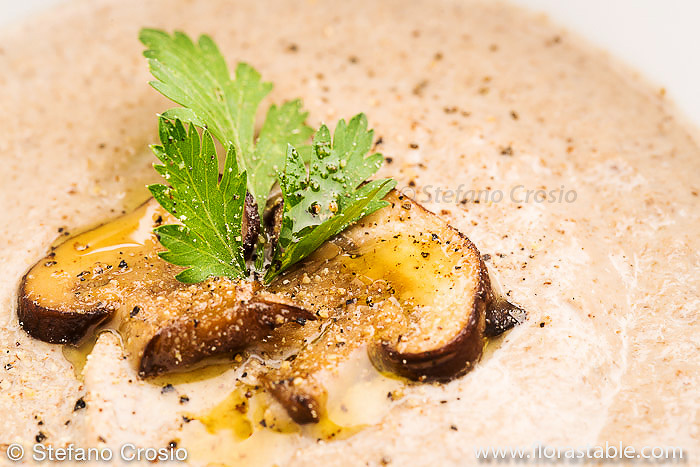 And this wonderful mushroom soup is timeless anyway!